The International Olympic Committee remains confident the United States will deliver a bid to host the 2024 Summer Games despite Boston's withdrawal from the race on Monday. 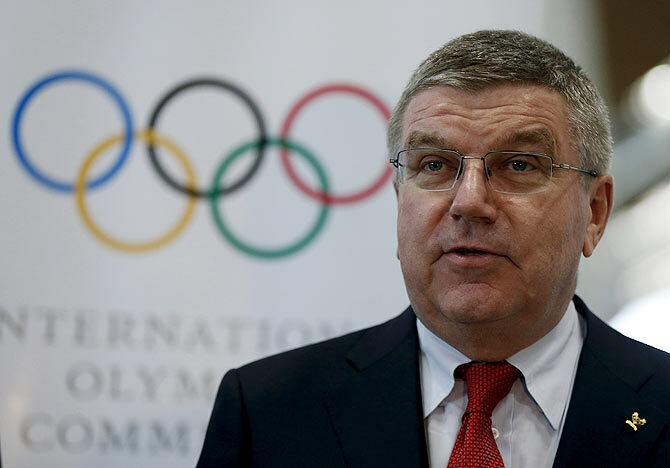 "For the IOC this was always about an American bid put forward by the United States Olympic Committee," IOC President Thomas Bach told reporters on the opening day of an Executive Board meeting in the Malaysian capital on Tuesday. "This invitation phase is also an opportunity to determine which city will eventually be chosen by a National Olympic Committee. We are confident that USOC (U.S. Olympic Committee) will choose the most appropriate city for a strong US bid." Just hours before the Kuala Lumpur meeting opened, USOC rescinded Boston's bid to host the 2024 Games after the mayor said his city's taxpayers could not afford to host the large-scale event. The news is the latest setback for the Olympic bidding process and comes after four cities dropped out of the running for the 2022 Winter Games. Chinese capital and 2008 Summer Games host Beijing will go head-to-head with the little-known Kazakh city of Almaty for the right to host the 2022 Olympics when the IOC elects the winner at its 128th Session in Malaysia later this week. The IOC has since passed a string of reforms to make bidding more attractive to cities. "USOC have made it clear that they would still very much like to see a U.S. city host the Olympic Games 2024," IOC spokesman Mark Adams said. The deadline for applicant city submissions for the 2024 Games is Sept. 15 with Hamburg, Paris, Rome and Budapest already having entered the race. "We are confident that the U.S. will make the right choice and that they can still put forward a strong candidate by 15 September," Adams added. Los Angeles Mayor Eric Garcetti has said his city, which hosted one of the most successful Games in U.S. history in 1984, was interested in taking Boston's place. The United States last hosted the Summer Games in Atlanta in 1996. The IOC will elect a winning bid in 2017.